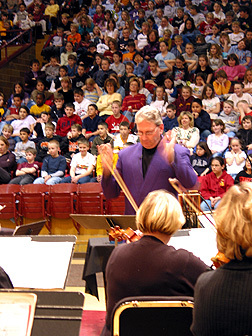 Bill Cahn conducted two educational and a Family concert with the Moorhead Symphony Orchestra with Nexus as guest performers. 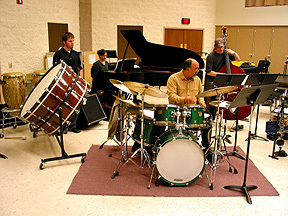 Both concerts show a history of percussion in the orchestra and as solo instruments. A high – light is the performance of Bill’s “The Birds”, a wonderful tone poem for bird and animal calls. The concerts are always successful, being well received by audiences, orchestra players and management. 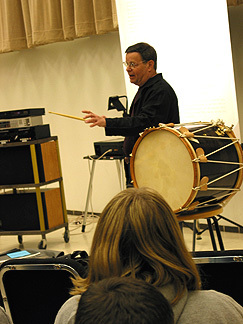 Our friend Bob is shown nailing the snare part to the Britten “The Young Person’s Guide to the Orchestra”. 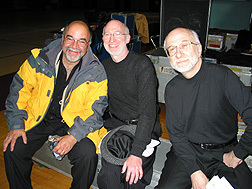 Memorial Auditorium was also the venue for Nexus’ solo concert which included a performance of Bob Becker’s work Palta with the Britain/ Moore Duo, Bill Law, electric bass and Peter Erskine playing the Tabla rhythms on drum set. Mat Britain played steel pans, Daniel Moore played vibraphone and the whole piece sailed away. What great fun and superlative playing! 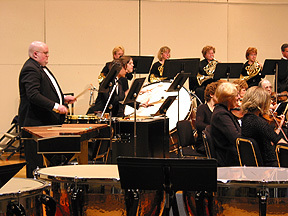 All the artists contributed to the success of the percussion days and were treated to the best hospitality in Minnesota where “all the women are strong , all the men good looking and the children above average”. 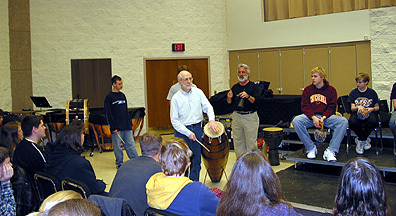 The photos show Peter working with the Concordia Jazz Ensemble, Robin making a point during his Field Drum History, Peter, Bob and Russ, the Palta ensemble and Russ at full tilt in his African drumming workshop. Finally, the whole crew. 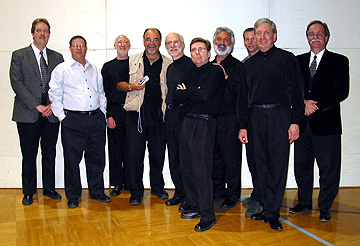 From l. to r.: our illustrious leader and host, Dr. David Eyler, Robin Engelman, Bob Becker, Peter Erskine, Russ Hartenberger, Daniel Moore – one of the funniest people I’ve ever met, Garry Kvistad, Mat Britain, Bill Cahn and finally the smooth and erudite Lowell Larsen who brought us all together and paid all the expenses. To experience the efficiency and thoughtfulness of both Gary Cook and David Eyler in the space of one week was a blessing. Long may they reign!